I would imagine that many Catholics outside of Brazil, like myself, had never heard of Our Lady of Aparecida before the celebrations this week at World Youth Day in Rio de Janerio. As a student of all things Marian, I am still learning the magnitude of Our Lady and the devotions to her throughout the world. 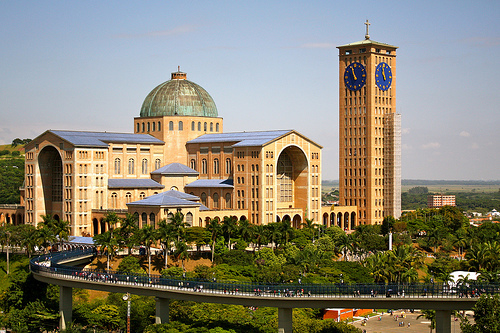 The Shrine and Basilica of Aparecida was one of the first public places that Pope Francis visited this week in Brazil. As many of you know, his love and devotion for the Blessed Mother is as strong as his predecessors. On the first day of his papacy, Pope Francis visited the Basilica of St. Mary Major in Rome. He dedicated his papacy to the Blessed Mother by presenting flowers at the altar there in the Basilica. As he visited the Basilica in Rome, he now visited the Basilica in Aparecida to ask for the success of World Youth Day. So what is the story behind Our Lady of Aparecida? It was October 1717 when the Count of Assumar, Dom Pedrom de Almedida, was on a journey from Sao Paulo to the state of Minas Gerais. In order to get to his final destination, he had to travel through a small city in the Paraiba River Valley by the name of Guarantinqueta. Knowing that he was going to visit, the people of this small town decided to throw the Count a massive banquet in his honor. They knew that large amounts of food were needed for such a banquet, however it was not the season for good fishing, and they needed countless amounts of fish to feed the Count and the towns people. The small town turned to its fishermen and asked for the impossible – you need to find fish! After hours of catching nothing, the fishermen were in great despair. As they were just about to give up, Joco threw his net over one more time near the Port of Itaguagu. As he pulled his net into the boat, the body of a statue came up with it. Domingo and Felipe were amazed at their friend’s discovery and decided to cast their nets into the water. As they brought their nets into the boat, the head of the statue was found. The three men cautiously cleaned the statue since it was fragile. They noticed the statue was Our Lady of the Immaculate Conception. Before they continued fishing, they wrapped the statue in some clothes. Realizing that the night had passed and they still had caught nothing, Felipe suggested that they continue to fish, but to fish with faith in the Virgin Aparecida (who appeared). From the moment they put their faith and trust in the Virgin, their nets became very full and were at the point of tearing. This was the first miracle of Our Lady of Aparecida. To this day, nobody really knows how the three-foot statue found its way to the bottom of the river, however, the artist is known. The artist is a “carioca” monk from Sao Paulo by the name of Frei Agostino de Jesus. He was known for creating clay sculptures. From the examination that took place after the three men found it, it was concluded that it was created around the year 1650. From being in the river many years, it lost its original color. The color of the image now is a brilliant dark brown and a thick embroidered cloth covers it. In 1904, the statue was capped with an imperial crown with precious stones. 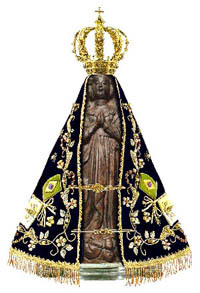 In 1930, Pope Pius XII proclaimed Our Lady of Aparecida as the primary patroness of Brazil. The feast day and national holiday for the Virgin Aparecida is October 12. On July 4, 1980, Blessed John Paul II visited the Shrine at Aparecida to proclaim it a Basilica. Although it was vandalized a few days before the Holy Father’s visit, through the work of artists, the statue was repaired. O Virgin of Aparecida, you came and provided great hope during a time of despair and answered the prayers of the faithful as the Immaculate Conception. Be with us during our times of desperation and hopelessness. Assist us in having greater faith in your Son, and our Lord Jesus Christ. Amen. 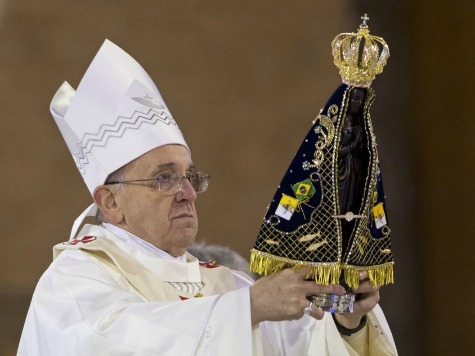 Our Lady of Aparecida…Pray For Us! I really like your Mondays with Mary Posts. Thought about doing something similar with my blog but I dont want to take away from what you’ve got going on here. Keep up the great work. Thanks Joe! I really enjoy writing these blog posts. Tanx Tom for your post l have added another knowledge on the wonders of our blessed mother Mary. I love her so dearly. She had & has never ceased to come tp my help. l honour her with my daily Rosary. Any day l miss it l feel so guilty. Do send me more post. God bless you. Hi Prisca – you can subscribe to my blog on the right side of the Home page. Just enter your email and hit the follow button. Then go to your email account to approve it. Hope you can share my blog with family and friends. In Christ Through Mary!